One glance at a map of Pernambuco is enough to notice how different the state is. A narrow strip of land with only 187 kilometers (116 miles) of coastline, Pernambuco extends for 724 kilometers (450 miles) into the sertão. It was on this very stretch of coast that Portuguese nobleman Duarte Coelho landed in 1535 to assume the captaincy Dom João III conferred upon him. Future colonizers found a shore protected by reefs, which explains why the Indians nicknamed this land "Paranampuca" (Sea that Breaks on Rocks), a name that ultimately prevailed over the official Nova Lusitania. The best way to familiarize oneself with Pernambuco is to begin in Recife and Olinda, twin colonial cities that offer the most historical insight into the region. Both preserve traces of their colonial history in their monuments and extraordinarily rich culture, and both share unique Carnival traditions: the maracatu, caboclinhos and frevo groups, a mix of Portuguese, African and Indian cultures, originally practiced their arts on Pernambuco's sugarcane plantations. Starting out from Recife, follow the coast, where beaches with calm, warm waters appear amidst summer houses and sophisticated hotels. It's about 535 kilometers (332 miles) east from here to the beautiful archipelago of Fernando de Noronha. For a deeper knowledge of regional culture, visit the Zona da Mata, birthplace of the maracatu rural folk dance. Authentic native handicrafts are available in the nearby agreste region, as well as the semi-arid sertão, whose lands hide a harsh beauty. • Explore the cultural routes and architecture of Recife and Olinda. • Witness the natural beauty of Cabo de Santo Agostinho coast and Tamandaré. • Marvel at an underwater paradise just off Fernando de Noronha island. • See first-hand the traditional folklore and handicrafts of the Zona da Mata region. • Follow the wine route of the sertão and check out ceramics from Caruaru, in the semi-arid agreste region. • Summer brings crowds and higher prices to Pernambuco beaches, as well as Fernando de Noronha island and the surrounding archipelago. But pleasant temperatures make these areas acessible anytime of year. • Between February and March, the festivities of Carnival combine fun and folklore. • In June, São João festivities bring fairs and bonfires to towns in the agreste and sertão regions. Pernambuco is unique. Just like its name, made up of ten letters that do not repeat themselves. Pernambuco is an experience beyond comparison. A State to be experienced by all our senses. A land of welcoming people, with countless natural beauties and monuments that tell the history of Brazil. Pernambuco has enchanting beaches such as Porto de Galinhas, chosen eight times as the most beautiful beach in Brazil. There are 187 kilometers of coastline, with blue seas and warm waters year round. Some of the most important regional traditions like the month of June St. John’s festivities, and the cavalhada (medieval tournaments) as well as figurative arts, are very much alive in the interior of the State. Some of the top awards winning wines in South America are produced right in the heart of the Sertão (inland arid region) of the São Francisco River, a region that also exports fruits to many parts of the world. Pernambuco is good to work in and better yet to live in. It is the fastest growing state in the country, with income parity and distribution being promoted. It is a place with a glorious past and where the future is being built. In the past few years, Pernambuco has received major investments, such as a shipyard, an oil refinery, and a plasma derivative products plant, in addition to the modern Suape Port. With an excellent hotel infrastructure, good roads, and an international airport with a five million passengers per year capacity. In the Indian language of Tupi-Guarani, Pernambuco is Paranampuka, which means “where the sea breaks”, a name given by the Indians because of the rock formations on the seashore. Years later, this same geographical feature, called ar-recif by the Arabs, would baptize the capital of Pernambuco, the city of Recife. For some researchers, the history of Pernambuco precedes that of Brazil. According to those who support this point of view, the Spaniard Vicente Pinzon landed in Cabo de Santo Agostinho (Southern Coast) in 1498, two years before Portuguese explorer Pedro Álvares Cabral arrived with his fleet. Regardless of any controversy, the first Portuguese settlers came to Pernambuco in 1501 and soon settled down, planting sugar cane and exploring some natural resources. Later on, they brought African slaves from many different nations to work on the sugar cane plantations. In the Brazilian slave quarters, slaves had to disguise their religious beliefs, so they pretended to worship Catholic saints while praying to their Orixás (deities). That’s how Candomblé started, a religion created from syncretism, uniting Christian deities to African ones. The State of Pernambuco had a strong Jewish, French, English and Spanish influence. Between 1630 and 1654, Pernambuco lived under the rule of Dutch invaders. It was a period of great urban and cultural development led by Count Maurício de Nassau. During this time, Recife was called Mauritsstad, or Mauricéia, the city of Maurício. During Dutch rule, bridges and public squares were built, art galleries were opened, and a cow was even seen flying over the Capibaribe River. The Dutch were eventually defeated by the forces of the Portuguese Crown, this being the first time that Indians, whites and blacks fought together in the ranks. In order to remain in Brazil, however, some Dutch migrated to the interior regions of Agreste and Sertão where they took up residence. The English came in the XVIII century and here they built railroads and installed public lightning systems. They also brought to Recife the fondness for football. To this day, there is a British Cemetery in the capital of the State, which is where the English were buried. This is where the tomb of Abreu e Lima, the liberator of the Americas, is. With influences from so many people and cultures, the people of Pernambuco are open to new views and perspectives. Cosmopolitan by nature, Pernambuco was able to retain its roots without losing the ability to take in information coming from other places. On a tour of the churches, chapels, convents, museums and mansions of Pernambuco one will find some of the most beautiful contributions by Portugal in terms of Brazilian architecture. In the facades or the interior of buildings and houses, the ceramic tiles on the walls are from the Portuguese colonial period. There is a real treasure in the State made up of ceramic tiles stamped with religious motifs or designs that are based on Portuguese embroidery or damask fabrics from the Middle East. It is the second largest ceramic tile collection in Brazil, including both civil and religious architecture. Religious architecture – Baroque blue ceramic tiles, originally from a period that stretches from the XVII century until mid XVIII century, have religious themes, such as the life of Christ, angels and patron saints of various religious orders. The master ceramic tile makers used the color blue for one simple reason: instead of working with several oxides, they just had to use cobalt. It was just a matter of using more or less of this oxide, according to the nuances wanted, and that Museu da Abolição – Recife was it for the final art work. The ceramic tiles works were also influenced by the aesthetics of Chinese porcelain found in Europe at the time. Walls, wash basins, domes, ceilings, naves and even the front of an altar, as is the case only in Brazil, in the Chapel of Nossa Senhora da Piedade (Our Lady of Mercy), in the city of Jaboatão dos Guararapes, are all examples of the colonial heritage. This Chapel was built in 1683. Pernambuco has the only ceramic tiled altar in Brazil. This precious item is in the Church of Senhora dos Prazeres, also in the city of Jaboatão dos Guararapes. The house of the Benedictine Order does not have the wealth of baroque panels other places do, but it does have ornate ceramic tiles that occupy almost the entire wall of the nave of the church. In Recife, collections of Portuguese ceramic tiles can be found in Monteiro Public Square (Monteiro neighborhood), Casa Forte Public Square, in the Joaquim Nabuco Foundation headquarters (Casa Forte neighborhood), São Pedro Courtyard, Imperador Street, Direita Street (Santo Antônio neighborhood), in the building of the Academia Pernambucana de Letras (Pernambuco Writers’ Academy, Aflitos neighborhood), Santa Cruz Street (Santa Cruz Public Square), in the Blue Angel Receptions Mansion (Benfica neighborhood) and in the Museu da Abolição (Abolition Museum, Madalena neighborhood). On a tour of the historical city of Olinda, one can find facades with Portuguese ceramic tiles. Origin – Ceramic tiles are of Arab origin, having reached the Iberian Peninsula first through Spain in the XIV century and then Portugal in the XV century. At the time, the material used was imported from Arab countries, but soon after, Portugal started its own production. The Power of Nature Nature was extremely generous with Pernambuco. Besides 187 km of coastline, one will find mountains, waterfalls, observation points, caves and a great diversity of climate and vegetation. If sun and sea is the subject at hand, then Porto de Galinhas Beach rules supreme. Chosen nine times as the best beach in Brazil by readers of the most important traveling magazine in the country, Porto de Galinhas is only 70 km away from the capital of Pernambuco. The beach has an excellent hotel infrastructure, with six resorts, 13 hotels and almost 200 inns. It receives almost 2 million visitors annually, a guarantee of an exciting night life and excellent cuisine year round. Maracaípe, Carneiros, Muro Alto, Tamandaré and São José da Coroa Grande, complete the impressive scenic beauty of Pernambuco’s South Coast. In the North Coast, tourists can enjoy calm and clear waters that are perfect for practicing nautical sports. The region is also home to a rich historical and cultural tradition, with buildings from the colonial period that are considered to be historical assets. Fort Orange, located in Itamaracá Island, is an architectural relic built during the Dutch invasion of Brazil. The Fort is located in front of the Coroa do Avião islet, a breeding ground for dozens of bird species. A perfect place for diving, the archipelago has an excellent infrastructure for the practice of this sport. Noronha is also the right place for those who like trails and adventures. Since the entire archipelago is a Natural Heritage of the World (UNESCO), there are no resorts there. However, the available inns are excellent. Some of them have even been chosen by specialized magazines as among the best in Brazil. The Zona da Mata region (region that extends from the coast to about 200 km inland) is where the secrets from the sugar cane cycle are kept, with centuries old sugar mills and houses that take the visitor back to the XVII and XVIII centuries. Among the sugar cane fields, the wisdom of the local people created the local traditions of maracatus (percussion based rhythm), the caboclinho (a folkloric dance), the cavalo marinho (a folkloric presentation, dance) and the arts born of clay and from lace. The Agreste (an inland region) of Pernambuco is the birthplace of figurative arts. The city of Caruarau open market, the largest handicraft market in the Americas, is located in this region. The cuisine in this region is one of the richest and most diversified in the State, mixing the flavor of a Swiss fondue with the regional dry beef. The São Francisco Valley is the second largest grape producer in the country, producing 8 million liters of a number of varieties of fine wines, right in the middle of the Sertão (inland semi-arid region). The rich local handicrafts and cuisine based on goat dishes give this region its special charm. The sertão, where rain is scarce and irregular, average temperatures are high, and the vegetation (called caatinga) is adapted to such tough conditions. 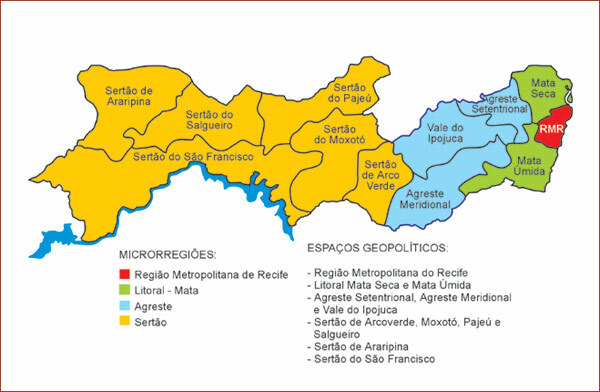 Roughly speaking, the sertão is the area to the west of Arcoverde; Serra Talhada, Cabrobó and Salgueiro are important cities of the sertão. Petrolina, although also in the semi-arid zone, has benefited from the irrigation of the river São Francisco, and has become an important center of irrigated agriculture. Twin cities, but with different profiles and vocations. That’s how Recife and neighboring Olinda are. According to a definition from poet and composer Alceu Valença, Recife is the brother, more serious and rational, while Olinda is the sister, more romantic and more of a dreamer. Whether this artist is right or not a tourist can only find out if he visits both places. The fact is that both cities are among the oldest cities in Brazil, and both have an important cultural and artistic heritage. Crisscrossed by three large rivers (Tejipió, Capibaribe and Beberibe), Recife is connected by a large number of bridges, without them it would be impossible to get around the islands that are part of the city. The oldest bridge in the country, Maurício de Nassau bridge, built in 1643, is located in the in the heart of downtown of the capital of Pernambuco. This feature of the city allows for some beautiful boat rides in the rivers, always in late afternoon. Late afternoon is also a good time for strolling along the Boa Viagem Beach sidewalk. In Recife you will find some of the oldest churches in the country, like the Church of São Pedro (Saint Peter), the Church of Nossa Senhora do Rosário dos Homens Pretos (Our Lady of the Rosary of Black Men, a church built for slaves Recife only), and the Church of Nossa Senhora do Carmo e Madre de Deus. All these churches are in excellent condition with their original aisles well preserved and they all have a rich historical collection. The first synagogue of the Americas, Kahal Zur Israel, from 1636, is also located in Recife. The city has a modern airport, with a 5 million passengers per year capacity. It also has an excellent hotel infrastructure and some of the best cuisine in the country. Large shopping centers make Recife the most important shopping hub in the region. Considered by UNESCO a “Natural and Cultural World Heritage” since 1982, Olinda is a source of pride to all those from Pernambuco. It is in its steep streets that the most democratic and irreverent Carnival in the world takes place. Built on seven hills, Olinda has some amazing observation points, surrounded by historical houses of rare beauty. Visits to the Church of Sé and the São Bento Monastery cannot be left out. During the month of September, the city is host to an international classical music festival, with performances inside the churches. When in Olinda, one must taste the delicious tapiocas (a local dish) served in historical sites. Speaking of cuisine, in the past few years, the city of Olinda has become an haute cuisine paradise. Renowned Chefs have chosen to open restaurants in Olinda. These restaurants are usually located in old mansions, giving each of them a special charm. As one can imagine, so much beauty in one place has attracted dozens of artists from all over Brazil. In Olinda, one can visit studios and talk to various artists. This beautiful city has good hotels and cozy inns that during carnival also offer day use rates. Fernando de Noronha is one of the most beautiful places on earth. This statement, which may sound somewhat pretentious, can be confirmed by anyone who has visited the archipelago. Made up of volcanic rock and located 545 km from Recife, Fernando de Noronha is a UNESCO World Heritage Site. The main island is the only one that is inhabited and is where São Miguel Palace, the administrative center, is located. Before becoming an important environmental preservation and research center, Fernando de Noronha was a prison. Part of the facilities built to house the prisoners can still be visited. Later on, the archipelago was a military base during World War II. The facilities built by the Americans during the war have been converted into a tourism center. In the 1960s, researchers from all over the world started to visit Fernando de Noronha, interested in its vast marine life. Some endemic reptile and bird species were discovered there. Noronha is home to one of the few oceanic mangroves in the world. Nowadays, the archipelago is controlled by environmental agencies in order to preserve its delicate ecosystems. Tourists are always welcome, and the local population that works with tourism is being constantly trained so they can better serve the tourists. The number of visitors, however, is limited, which is why it is important to schedule your trip well in advance. Upon arriving in the archipelago, tourists will find a paradise without equal. Water visibility can reach 30 meters, which is perfect for diving. For those who enjoy surfing, Fernando de Noronha is one of the best spots in South America. Tube shaped waves have given the place the nickname of Brazilian Hawaii. But the archipelago doesn’t survive from the sea only. Trails that cut through the oceanic forest can lead visitors to some beautiful observation points. At nighttime, a local music and dance “forró de pé de serra”, provides the fun for tourists and locals alike. What is the best beach in Brazil? The answer is easy, Porto de Galinhas. It’s not only the people from Pernambuco who make this statement, Porto de Galinhas has been chosen nine times in a row as the best beach in the country by the largest national travelling magazine. The natural pools of the resort enchant all visitors. It’s no wonder this happens, after all, those who visit have the opportunity to swim among the dozens of fish schools and relax while bathing in always warm waters. This is possible in all low tides when the huge reef formations are exposed. The natural pools can be reached on foot or by riding some local rafts, when the entire coast can be seen. It is a perfect place for swimming and ideal for children because the sea is always calm. Buggy car rides give the tourist the chance to visit beautiful neighboring beaches. Maracaípe is a surfer’s paradise. Because of its big waves, the beach hosts some of the most important surfing competitions in the Northeast Region and attracts practitioners of other sports such as paragliding windsurf. Cupe and Merepe are also popular with extreme sports fans. Muro Alto (High Wall) earned its nickname because of a rock formation on the beach. The beach is quiet and favored by families year round. Porto de Galinhas has an excellent hotel infrastructure that includes large resorts, hotels and inns. Porto de Galinhas is also the ideal place for those looking for excitement. With dozens of restaurants, bars, shops and nightclubs, the village of Porto has options for all tastes. Pernambuco has one of the best hotel networks in the Northeast. There are over 62 thousand beds available in hotels, inns and resorts. Some of them can be listed among the best in the country according to readers from some of the top national tourism magazines. Pernambuco’s calendar of festivities lasts all year long. During Carnival, Frevo, the most traditional rhythm of Pernambuco, rules. Carnival is a treat for the eyes and ears. For one month, in the streets of Olinda and Recife, millions of revelers enjoy Carnival without being cordoned off, without having to pay admission and without biases, in the most democratic street celebration in the world. Each participant can make up his own costume, showing off all the creativity and irreverence of the Brazilian people. Besides regional rhythms, Carnival also has space for other musical expressions such as samba, reggae, ska and rock. Even original Argentine tango groups have taken part of the festivities. In Olinda, declared by UNESCO a “Natural and Cultural World Heritage” in 1982, excellent inns offer day use rates for those who want to enjoy the day with plenty of comfort. Carnival in Pernambuco, however, is not restricted to Recife and Olinda only, festivities take place in many other regions of the State. In the city of Bezerros (Agreste region, 111 km from Recife) the fun is provided by traditional Papangus, groups of masked revelers that parade through the streets of the city. In the city of Goiana (Zona da Mata region, 63 km from Recife) the festivities belong to the caboclinhos, a dance of indigenous origin with a strong rhythm, highlighted by the sound of flutes and the snap of arrows. The meeting of rural maracatus in the city of Nazaré da Mata (Zona da Mata Pífanos Band - Caruaru Maracatu Rural - Nazaré da Mata region, 65 km from Recife) is something that cannot be missed. There are more than one hundred groups, made up field workers that work on sugar cane plantations all year long. During Carnival they dress up as imposing spear warriors and perform their special dance for the public in general. Of African origin, the rural maracatu follows melodies from Portugal, which are improvised by the singers. All of this is free of charge. During the traditional month of June St. John’s festivities, the entire State of Pernambuco turns into a huge countryside celebration. In every city one will find bonfires burning, streamers flying and quadrilhas (square dance like groups). Traditional foods are made from corn, and those who come to enjoy the festivities will find a banquet awaiting them. The forró dance is mandatory in June, so that everyone dances close to each other all night long. The city of Caruaru, in the Agreste region, is the main stage for the St. John’s festivities and receives over one million visitors during the days the festivities take place. Holy Week is a time when thousands of believers go to a place in Pernambuco, where the largest outdoor theater in the world is located: Nova Jerusalém (New Jerusalem), in the city of Brejo da Madre de Deus (Agreste region). It is here that every year The Passion of the Christ is performed with internationally known actors as members of the cast. During the Christmas holidays, the pastoris (outdoor folk plays) take over the streets from the capital all the way to the inland sertão region, mixing the secular with the religious. But in Pernambuco there are many other festivities such as Cavalhada, Pega de Boi, the Samba de Véio, the Mazurca, the Samba de Latada, the Ciranda and the Coco. Expressions that are kept alive by the strength of the people of Pernambuco. The large melting pot of ethnicities and cultures that is Pernambuco, has turned the State into the great temple of Brazilian miscegenation. Cultural manifestations of great value and from various influences originated here. This mix can be seen in festivals, dances, music, plastic arts and in the many historical assets that the State has. Pernambuco is home to some of the oldest churches in the continent and also to the first synagogue in the Americas. Always open to new experiences and new knowledge, Pernambuco took in generations of scientists and intellectuals who were responsible for monuments such as Malakoff Tower and the Law School, and also buildings and parks projected by modern architects, such as Louis Vauthier from France. Roberto Burle Marx is responsible for landscaping projects of 10 important public squares in the capital of Pernambuco: República, Faria Neves (Dois Bom Jesus Street – Recife Irmãos neighborhood), Euclides da Cunha (Madalena neighborhood) and Casa Forte, are among the most frequented. Some of the best know thinkers in Brazil are from Pernambuco, like poets and writers Manuel Bandeira, João Cabral de Melo Neto, Carlos Pena Filho, Ascenso Ferreira, José Lins do Rêgo and Gilberto Freyre. In Pernambuco one will find the art of Mestre Vitalino, a sculptor who was able to register true narratives in clay, capturing as no one else could, the life of the people from the Northeast. There is also the fantastic world of ceramics artist Francisco Brennand, a world inhabited by grandiose pieces that are full of mystery. The artist’s workshop is located in his family’s old brick factory and is open to the public. It is a magical place, with pieces that show Brennand’s evolution as an artist. The workshop’s location also serves to protect an important area of Atlantic Forest. A visit to the Museu de Armas Castelo São João (St. John Arms Castle Museum) cannot be left out. This museum was founded by a collector from Pernambuco, Ricardo Brennand, over fifty years ago. He has been acquiring works of art from different places and eras, covering a time period between the 15th and 21st centuries, with works from Europe, Asia, the Americas and Africa. These works of art are grouped in collections of Brazilian and foreign Paintings, Armoury, Tapestry, Decorative Arts, Sculptures and Furniture. In the field of music, Pernambuco is the birthplace of the King of Baião (a local music and dance), Luiz Gonzaga, and of the Armorial movement, led by Ariano Suassuna. It is the land of Lenine and of the manguebeat of Nação Zumbi, the most influential expression of contemporary Brazilian music.